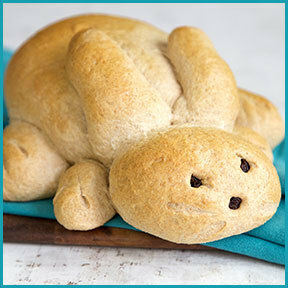 Our incredible Honey Whole Wheat bread bunnies are available for pre-order through Easter! Honey Bunnies are a one-of-a-kind Great Harvest tradition! They’re sweet, adorable and multiplying by the minute! We’re baking up lots of these cuties. They feature awesome ingredients like freshly milled whole grain flour and natural honey, and are perfect as a table centerpiece, in a child’s Easter basket and as a gift for a friend, loved one or hostess. AVAILABLE FOR PRE-OPRDERS THROUGH EASTER! goodies for you and your loved ones to enjoy. Tie-Dyed rolls are BACK!